Welcome back, friends. This week in our logbook of craziness, we take a look at a rising star from the far east. Breakout opportunities are few and far between for female workers in Southeast Asia unless you are willing to take your craft on the road, and show people what you have to offer the market. Tyra Russamee has embraced this ideal as she regularly traverses the globe in search of creating a name for herself. 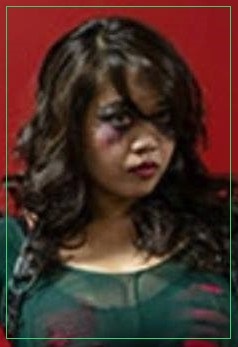 The up and comer from Bangkok, Thailand is no stranger to promotions in Australia, Singapore, Malaysia, and here in the United States as well. She made her debut last year in India to a capacity crowd of five thousand fans who were hungry for the product. As larger companies like WWE press farther out into these new markets and areas of untapped business it likewise opens the doors for independent workers to make their way there as well. The fans in India especially are ready for professional wrestling now more than ever before in the history of the business. For workers like Russamee who value the traditional ways of coming up in the business, being able to work in front of crowds this size are truly moments that will never forgotten. The huge pop off of a hot crowd can be worth more than the payout for the event itself. One of the most refreshing things that I got out of this interview with Tyra was that she is grounded in the old school ideals of paying dues and earning her way up the ladder. From setting up the floor before the show to breaking down the ring at the end of the night, she is a welcome throw back to the days of the business when that was all part of cutting your teeth and getting the acceptance of “the boys”. She works the heel spot the same way. Methodical in her pace, with the tense gaze of a Terminator she stalks her prey across the ring relentlessly, giving the crowd no doubts about who is in charge. Even though she’s still fairly new to the game herself, she carries herself with a strong presence in the ring. In true heel fashion, she is learning how to manipulate the fans, while still making her opponent look good. Sometimes part of paying dues is also learning how to deal with the adversity of a set-back, as Tyra would find out on a trip to Colorado. As the year was coming to an end, Russamee would travel to Denver, to be part of an event being presented by Rocky Mountain Pro Wrestling. The venue was the Rackhouse Brewery, and as usual Tyra was helping set up chairs and carry ring ropes when she found out that her spot for the evening was going to be a tag match. She went to the back to find her teammates for the match. Her tag partner was fellow heel, Aria Aurora and they were set to be going up against faces Rachelle Rivetor, and Laynie Luck. Tyra was familiar with Laynie and excited to be getting the opportunity to work with her. They went over the idea for how the match should go and began to get ready, as they were on early in the show. The match went off as planned all the way up until the finish. The duo were putting over the faces, and were set to get double powerbombed out of opposite corners. Laynie hoisted Tyra up and dropped the move on her just as Rachelle did likewise to her partner Aria on the other side of the ring. It appeared to go off as planned and the faces celebrated their win. But, it hadn’t gone off as Tyra had planned. As soon as she hit the mat she felt a hot pain in her arm around the elbow. When she tried to roll onto it to get back it, she knew immediately that something was wrong. Her friend Joe McDougal was with her that evening and quickly called 911 when the referee threw up the crossed arm signal to the back. This signal is known, industry wide as the sign that a worker has been hurt. The crowd was so sold that they thought it was all part of the show, but a few of the other workers popped their heads out of the back to see what had happened. Russamee was stretchered out after laying in the ring almost twenty minutes. Once the crowd realized what was going, the atmosphere changed, and they cheered her out as she was carried away. The ambulance rushed her to the local hospital, where she was examined and x-rays were taken. 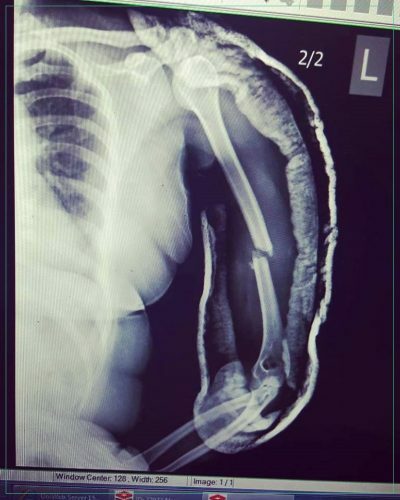 It was a clean break of the humerus above the elbow joint. She was given pain relief and later that evening, when the show was over she was visited by some of the crew, and MPW owner Matt Yaden. Tyra holds no bad feelings or holds any ill will, as these things just happen in the rough and tumble life of a professional wrestler. Her rehabilitation is coming along nicely and she is expecting to make a full return to the ring as soon as she’s able. Perseverance and a good attitude in the face of adversity is one of the most important qualities a wrestler can possess. Having the skills will only take you so far, if you don’t have the passion for whatever your chosen profession may be. I would like to thank Tyra for giving me the time to get this story and wish her a speedy recovery. Face or heel, every worker is just out there doing this thing that they love most, and seeing anyone get hurt or side-lined is always difficult. Well, that wraps up another installment of my look behind the curtain, into the crazy life of professional wrestling. Join me again next week, and remember….keep the wheels turning and the freedom burning Bruthas and Sistas. Peace.